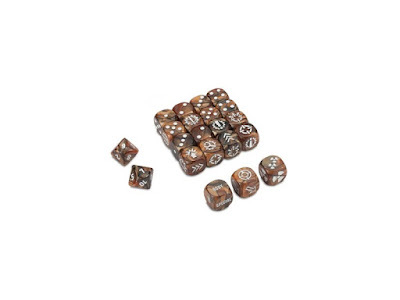 The galaxy is in flames. The Emperor’s glorious vision for humanity is in ruins, his armies locked in brutal civil war. 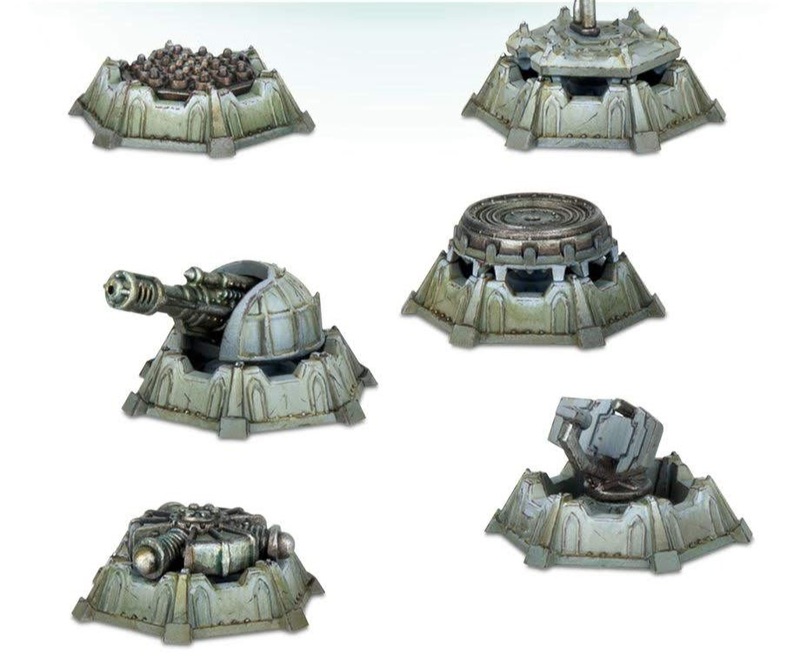 The greatest of these bitter combatants are the towering god-engines of the Adeptus Titanicus. 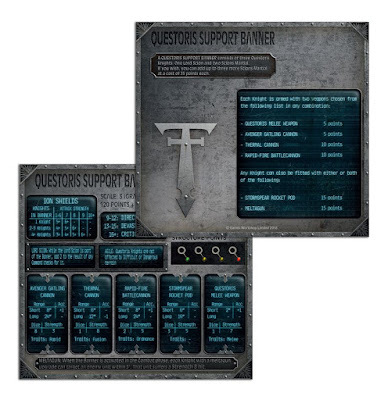 Those Titan Legions that remain loyal to the Emperor of Mankind fight boldly to stem the tide of treachery, holding the line on countless worlds as the Warmaster’s forces advance inexorably on Terra. 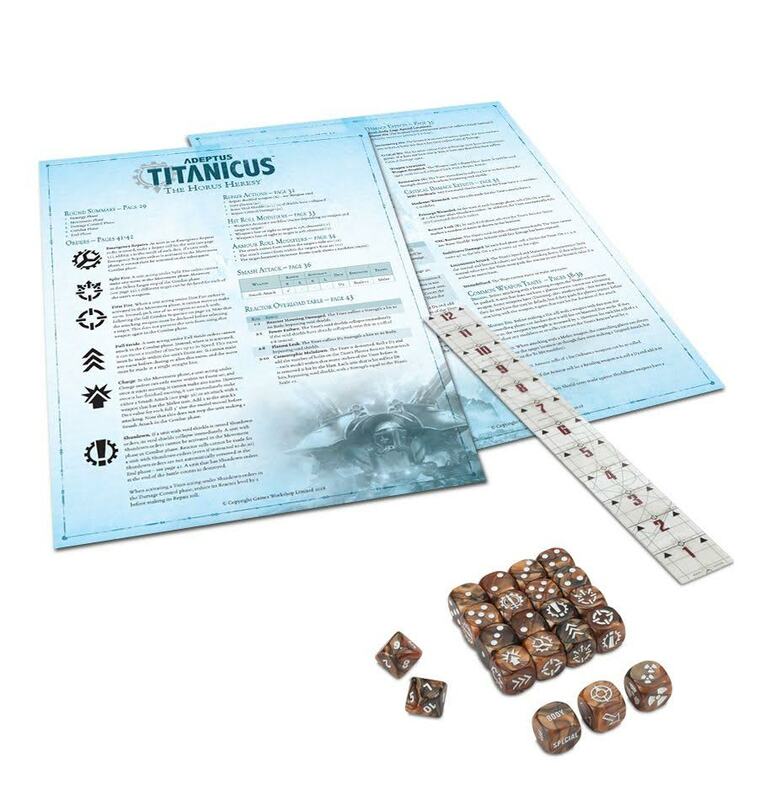 The Traitor Titan Orders march at the vanguard of the Warmaster’s hosts as they seek to bring the Imperium to its knees in the name of their twisted cause. 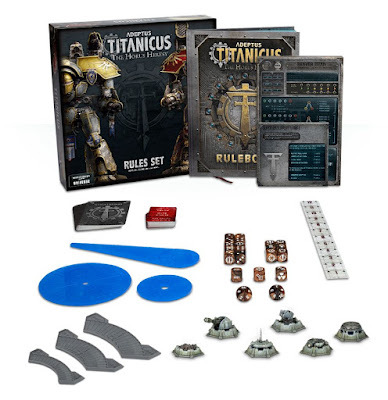 Adeptus Titanicus: The Horus Heresy is a tabletop game of devastating combat between awe-inspiring machines, set during the civil war that tore the galaxy apart. 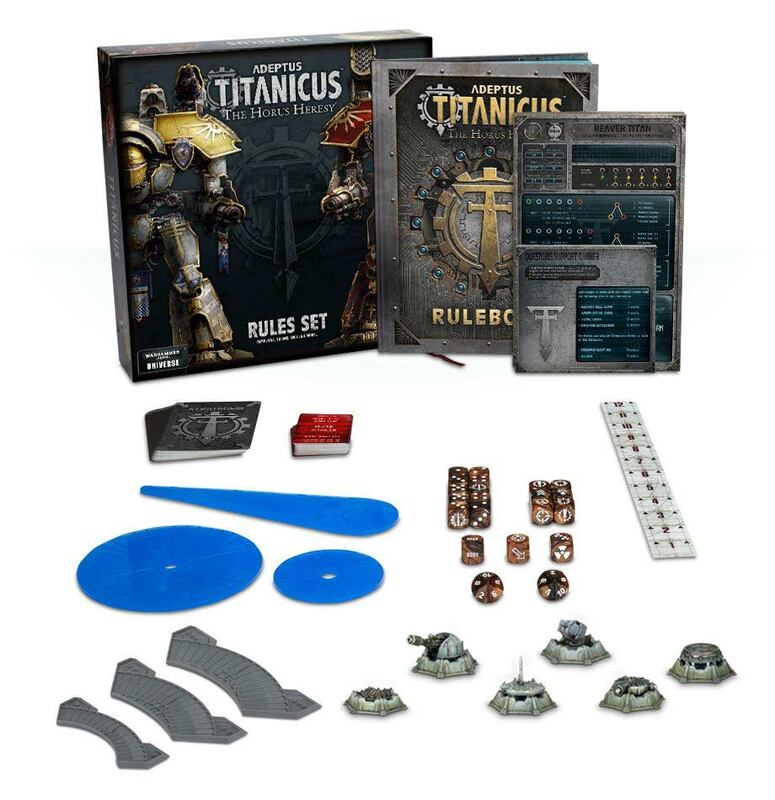 2 players take control of a variety of Titans colossal, bipedal war engines covered in thick armour and weapons which can level a city in a single salvo. It is a strategic challenge in which you pit your skill and cunning against your opponent in a battle to the death; a test of tactical skill demanding the management of the resources at your disposal, determining the optimal reactions to the evolving state of the battlefield. 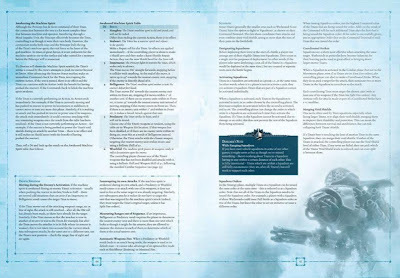 In the 96-page rulebook, you’ll find Basic, Advanced and Optional rules for play, along with detailed background on the Titan Legions, their creation and battles prior to and during the Horus Heresy. 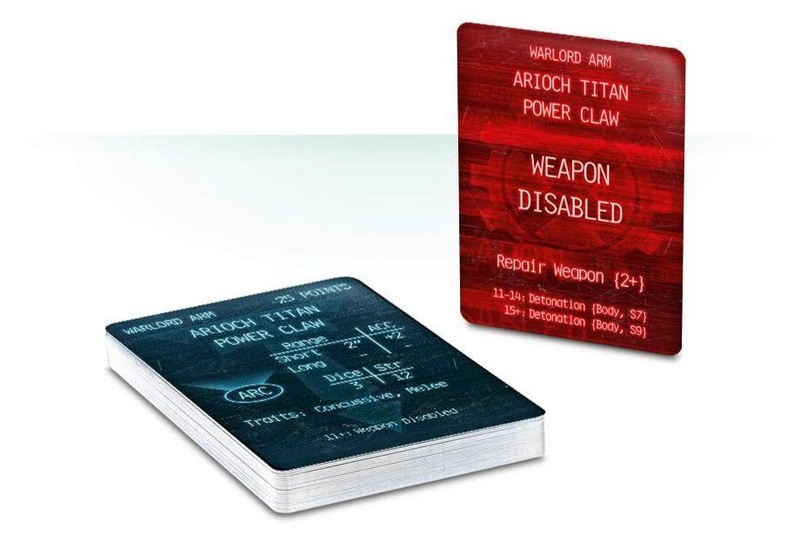 Throughout the book are presented annotated schematics and blueprints of a variety of Titans, along with examples of composition, heraldry and colour schemes of Knightly Banners and Titan Maniples. Rules Introduction: Adeptus Titanicus can present a daunting prospect at first, with the Advanced Rules being a comprehensive guide to piloting a Titan the Introduction section of this book is designed to ease you into the way this game is played, with annotated photographs demonstrating the setup, showing a battle in progress and clearly explaining how each accessory the Command Terminals, dice and arcs, particularly is used. Basic Rules: covering everything players need to know in their first few games, this section explains Rounds between 4 and 6 per game and the 5 Phases Strategy, Movement, Damage Control, Combat and End of which each Round consists. 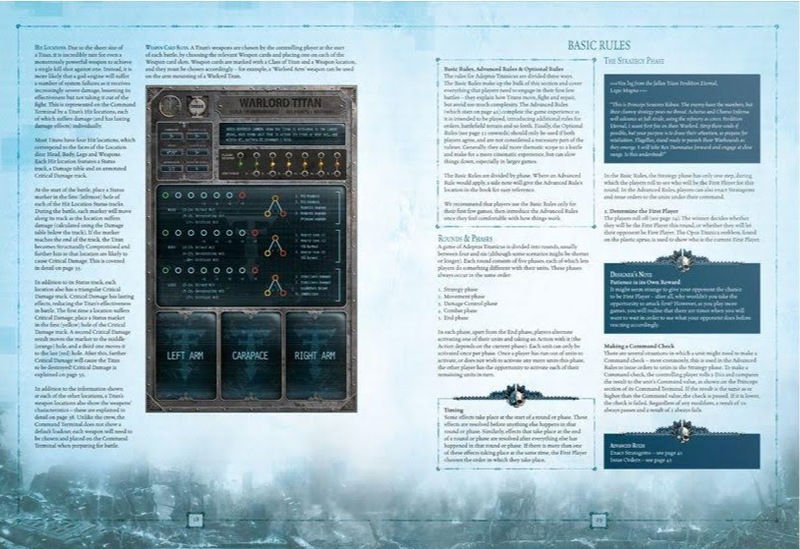 Each Phase is explained as an overview, with suggestions of Advanced Rules to add as you become more familiar with the game’s flow. Included is a mission Titanic Clash designed for use with the Basic Rules. 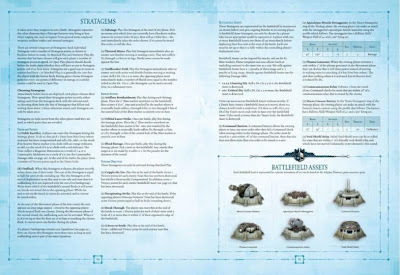 Fighting a Battle: 3 different ways of enjoying the brutal combat and evolving stories you’ll act out while playing are outlined here Narrative, Matched and Open Play. Open Play concentrates on the models themselves, with no restrictions simply place whichever Titans on the board you wish, and fight; Narrative Play uses missions to tell a story, and Matched Play balances the sides to make games pure tests of strategic ability. 6 missions are included, with advice on designing your own. Legions of the Adeptus Titanicus: descriptions and rules for Legio Gryphonicus and Legio Tempestus, each with its own Legion Trait, specific wargear, and choice of Princeps Seniores’ Personal Trait. 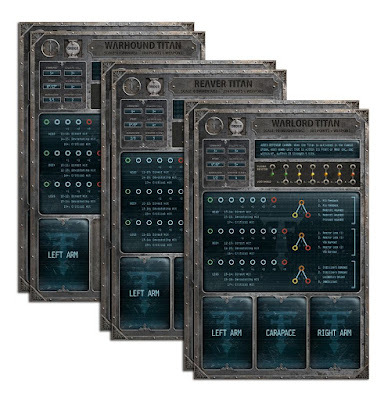 6 Titan Command Terminals: 2 Warlord Titan, 2 Reaver Titan, and 2 Warhound Titan Command Terminals, large card surfaces used to track the status of your Titans during games. 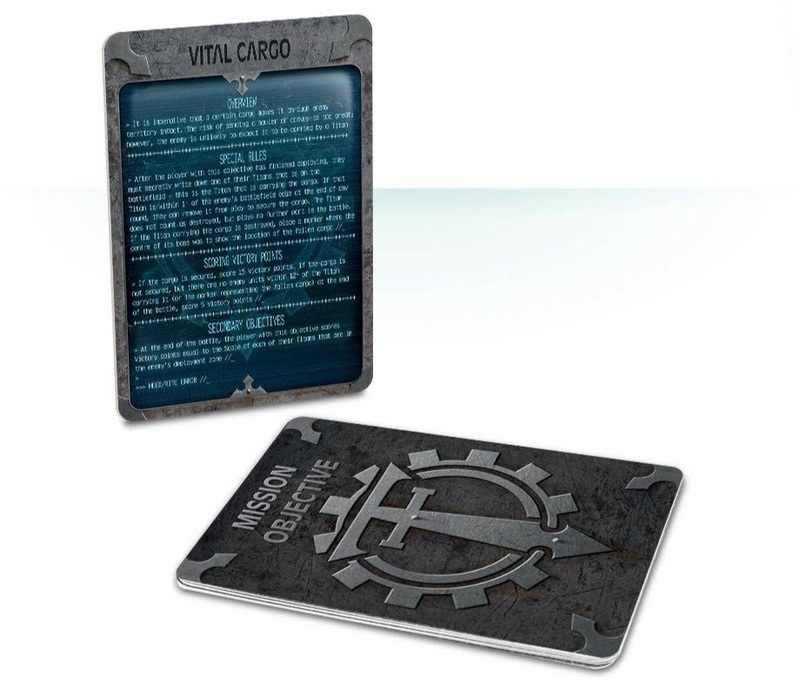 Battlefield Assets and Status Markers: Battlefield Assets are a frame of 6 plastic miniatures, used to represent certain Stratagems – this set includes 1 Macro Cannon Battery, 1 Apocalypse Missile Strong point, 1 Command Bastion, 1 Plasma Generator, 1 Communications Relay and 1 Void Shield Relay. Also included are markers for initiative, a wrecked Titan head which can be used as an objective marker, 50 status markers for use with Command Terminals, 6 designation markers for the Titans on the battlefield and 3 arc templates used to determine weapon firing arcs. 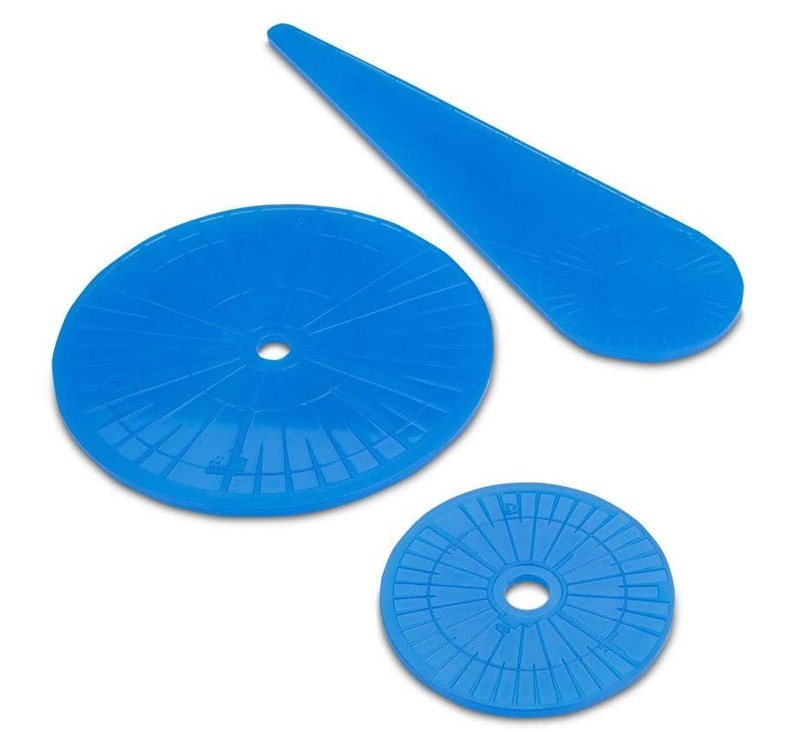 2 Clear Blast Markers and a Flame Template: representing explosions and fiery bursts in game.